An artist caught between eras and styles who briefly tested the waters of rock ‘n’ roll when it launched, perhaps inadvertently, before retreating back to the safer confines from which he came. Gene Phillips was born in 1915 and thus was already past thirty years old when rock came into being in 1947. He was a solid guitarist and a singer with a lusty voice specializing in up-tempo slightly off-color songs that had gotten him only moderate success to date. He was in essence a less refined Louis Jordan, the most popular of the pre-rock rhythmic stars in the black community who was also the single biggest influence on rock without ever becoming a rocker himself. Phillips, like so many others at the time, was like a pilot fish trying to sustain himself on the commercial scraps left behind by the dominant Jordan. Though possessing the required attributes to make a permanent move into rock ‘n’ roll Phillips only skirted the edges of the genre, unable to make the commitment to what at the time seemed like a risky commercial bet. 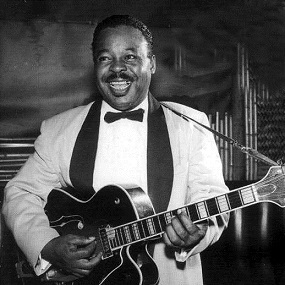 Though he did appear on some rock sessions as a guitarist for others, Amos Milburn among them, in the end Phillips goes down in history as a transitional artist who only briefly tried his hand in the rock field. As sideman… behind Amos Milburn.